Free e-book valued at $19.95! Youthsafe’s Deputy Chairperson, David Riches, has written a book “Teaching Aussie Teens to Drive”, based on his many years of experience as a road safety consultant as well as working with parents and young learner drivers. Teaching Aussie Kids to Drive by David Riches is a great resource for those parents undertaking the important role of teaching a young person to drive. Full of useful information and tips that will help that learning process run smoother and be of greater benefit to our next generation of drivers. The driver training industry is often asked by parents where they can go for additional information and support and a resource such as this helps to fill that need. I have known David for many years through his engagement with supervising drivers at local workshops, and his passion for helping our young people to remain safe while developing important life skills, is ever present. This book is the result of years of gathering information and dealing with the most common concerns from supervising drivers, and combining that with the knowledge provided to David from professionals in the industry. This book is a must for all supervisors of learner drivers. Supervisors of Learner drivers are always in desperate need of practical strategies to assist them in this complex driving journey with their teenagers. Youthsafe have finally filled the gap with this purposeful E-book. When used parallel with the Learner Log Book, it provides supervisors with specific and constructive tools to utilise. I would highly recommend every supervisor read Teaching Aussie Teens to Drive; it will help make the process less daunting and more enjoyable! David’s book is probably the best “How to” guide for parents teaching their kids how to drive. I am currently supervising two teenagers of my own and David’s stories, strategies and tips have been a godsend. David’s considerable experience and his friendly way of writing make this book the easiest way for parents to get their head around the sometimes nerve-wracking experience of sitting in the passenger seat. This book should be required reading for supervising drivers – I thank David for sharing his wisdom and humour. 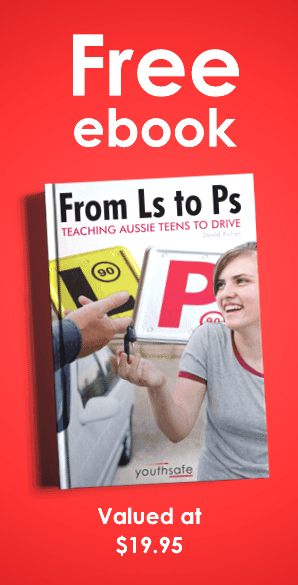 This page outlines the Terms and Conditions that apply when we provide you with a free copy of the eBook Ls to Ps: Teaching Aussie Teens to Drive. Please read these Terms and Conditions and register your acceptance of them by ticking the appropriate box on the web form Free Offer to access your copy. If you do not agree to these Terms and Conditions we will regrettably be unable to provide you with a copy of the eBook. We reserve the right to refuse to provide this offer to any person or entity at any time and such refusal to be made at our sole discretion. Youthsafe is a not for profit charity which partners to prevent unintentional injury of young people. We are located at Suite 304, 5-9 Devlin Street Ryde 2112. ABN 91 068 371 022. David Riches is the owner of the intellectual property rights of the content of the eBook Ls to Ps: Teaching Aussie Teens to Drive. This work is protected by Australian copyright law and the author’s rights are reserved. You may obtain one digital copy of the eBook for your personal use only. You may not share the copy in digital form across devices. David Riches’ status as the author of the eBook must always be acknowledged. You must not modify the eBook in any way. You must not use any part of the eBook for commercial purposes without obtaining the author’s express permission to do so. Information contained in this publication reflects the author’s many years’ practical experience helping parents and supervising drivers to teach learner drivers. While every care has been taken by the author and publisher to verify the accuracy of its contents at the time of publishing, laws and road rules do change from time to time and the reader is advised to check with all relevant laws and rules pertaining to their state or territory at the time they are beginning the learning to drive process. This publication is published and distributed on the basis that neither the author nor the publisher is responsible for the results of any actions taken by readers that may arise from any error or omission in the publication or misinterpretation of it by readers. To the extent permitted by law, the author and publisher expressly disclaim all and any liability and responsibility to any person, whether a reader of this publication or not, in respect of claims, losses or damages or any other matter, either direct or consequential, arising out of or in relation to the use and reliance, whether wholly or partially, upon any information contained or products referred to in this publication. We process information about you in accordance with the National Privacy Principles in the Privacy Act 1988 (Cth). By accepting this free eBook offer, you consent to such processing and you warrant that all data provided by you is accurate. Your assent of these Terms and Conditions is tantamount to an agreement covered by the laws in force in New South Wales. Accordingly, all parties must submit to the exclusive jurisdiction of the courts in that place although Youthsafe retains the right to bring proceedings against you for breach of these conditions. Youthsafe is committed to protecting and respecting your privacy. All information you provide to us is stored on our secure server. Please read the following carefully to understand our views and practices regarding your personal data and how we will treat it. Youthsafe is bound by the National Privacy Principles in the Privacy Act 1988 (Cth). We will collect and process the information that you provide when you accept our free eBook offer and agree to these Terms and Conditions. We may also use your data, or disclose your data to selected third parties, to provide you with information about goods and services which may be of interest to you and we or they may contact you about these. If you are a new customer, and where we permit selected third parties to use your data, we (or they) will contact you by electronic means only if you have consented to this. – If we are under a duty to disclose or share your personal data in order to comply with any legal obligation; or to protect the rights, property, or safety of our customers, or others. This includes exchanging information with other companies and organisations for the purposes of fraud protection and credit risk reduction. Youthsafe is working with Huddle, Australia’s most innovative finance brand. Huddle is on a mission to provide financial products (like insurance) whilst helping to fund important causes across Australia, like Youthsafe. People are already insuring their cars and travel with Huddle, knowing that each year, after fees and claims have been paid, the money that’s left over is given back to their chosen Huddle. So, you can choose to join the Youthsafe Huddle and then left-over funds will be donated to Youthsafe to help us keep young people safe on the roads, at work, while playing sport or when out with friends. To join the Youthsafe Huddle, click here.